Looking great in your jeans just got a little easier. 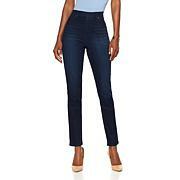 With a smoothing panel from waist to thigh, this 3-in-1 "shape shifter" jean might inspire an extra bit of confidence. Crafted from comfortable virtual stretch denim with built-in fit solution technology, they're the pair to wear when you want to look your best. Great fit! Very comfortable with beautiful colors. I'm ready for Summer colors. I really like thse jeans I just wished I could get a yellow pair, the white or cream color is very classy and will go great with any top. so comfortable to wear I really like these jeans. 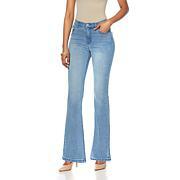 DG2 virtual stretch 3-1 really make even me look good plus size and petite 5 ft. This jean really holds you in at all the right places. I will buy another pair. They are very well made. I feel they run a bit large. Love how these jeans fit. They are a heavier weight demin with tons of stretch wash well and hold their color. My only complaint is that they are still 2 inches long on me and I ordered a petite. I would still order these again in a heartbeat.